Coming in at ten tracks, the eigth album by power metal jokesters follows their current flow of recent releases. Most of the songs here are lighthearted with a touch of 80's rock. The humor and silliness does wear on you a bit but the sound keeps you pushing through with, well, sabre and torch. Most of the songs here have the strong guitar leads one would come to expect and most of the riffs are memorable. With fast tempo songs mixing in slow parts when needed the musical writing is spot on. As previously mentioned, the songs do take a more fun and silly side most of the album which works in places ("Love Tyger") and become tiresome and almost dumb enough to piss you off ("Do Me Like A Caveman"). However, one thing this album does is have very catchy, anthemic chorus'. Especially on the track "Space Police", I haven't a heard a chorus that good in PM in a long while. What stops that song from being perfect is the part where (singer) Tobias Sammet tries making space noises. That's one of those moments where the dorky side of them is irritating. The cover of "Rock Me Amadeus" is both a good rendition and a welcome edition to this album. Vocally, Tobias sounds great with his mix of Bruce Dickinson-esque power vocals and the more Rock N' Roll rasp. The two bonus tracks are obviously the right choice as bonus tracks. "England" is a fun, albeit cheesy, song about how England is better because they have Iron Maiden. While the other one, "Aychim In Hysteria" is about the bands roadie put to a similar musical sound of Def Leppard's prime. While I wouldn't recommend this to someone who's not a fan of power metal, but if you are this is a good record to check out. 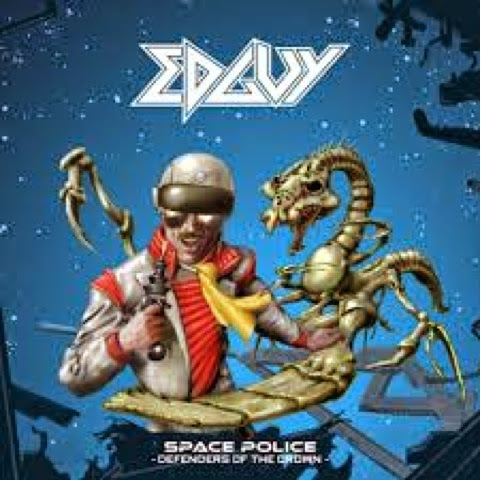 It may not hold up to Edguy's earlier work, or Tobias' Avantasia project for that matter, it's a fun and simple record. If you're in the mood for silly fun but burnt out your Manowar collection, go get this.